The adorable, 4’ x 4’ Honeypot Snug Tower & Slide Playhouse gives your kids the perfect reason to play outside and let their imaginations run wild as they host teddy bear tea parties, climb the ladders and have a lot of fun by zooming down the slide. There is no end to the fun that they can have inside the playhouse, on and under the decking and of course with the slide. The actual playhouse just oozes charm with that lovely apex roof, cute door with flower feature and plenty of windows so they can sit inside and watch the world go by. This is certainly going to be something they will enjoy for a very long time. Even though this is a very reasonably priced playhouse no corners have been cut and it has actually passed numerous safety tests. The walls are made with 12 mm thick, tongue and groove shiplap cladding and these are backed up with a very impressively strong frame. The floor and the roof is made from solid sheet boarding, making this a well made structure from top to bottom. The four windows are made with shatterproof styrene glazing which looks great and also means no broken glass, in general the whole playhouse has a very high quality feel to it. 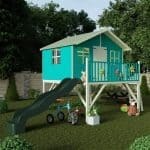 The 4’ x 4’ Honeypot Snug Tower & Slide Playhouse is an adorable tower style playhouse that is going to provide hours and hours of fun for the kids. We love the size of this playhouse and as it does have a rather compact design, gardens of all sizes are going to be able to accommodate this. The width of the actual playhouse is 4 feet 5 inches and the depth 4 feet so there is a lot of space for the kids to play. There is also a generous amount of headroom inside with the ridge height being, 4 feet 7 inches high and the eaves, 2 feet 9 inches. As well as the inside of the playhouse there is also the decking area and they could even roll around underneath it as well. The two play features of this playhouse are first of all that lovely little ladder that is child safe. This gives them a fun way to get up to the decking or even just a place to sit. On the front of the decking is a fun slide, we can see this slide getting a great deal of use from the kids themselves and them throwing their teddies down it. There is a very nice looking apex roof on the playhouse that is going to keep the rain out. The roof is made with solid sheet boarding and is then covered with some very high quality sand felt to protect the boards. We are very impressed with the quality of the roof, especially considering the low price of this. Those nice and colourful walls are made with 12 mm thick, tongue and groove shiplap cladding. 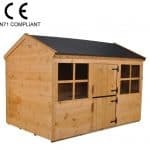 This is very well crafted cladding that is tightly put together so that it makes the inside of the playhouse waterproof. It also of course has a very charming and friendly look to it that the kids are going to really like. Inside the playhouse there is a very sturdy 28 mm x 28 mm frame which we know if you told the kids about you would be greeted with a who cares or a boring, but this frame is what is going to allow the kids to use this for many years. Solid sheet boarding is used for the floor just like it is the roof, while from a strength point of view this type of boarding is perfect for a child’s playhouse, we do wish they put something a little easier on the eye. The reason for this is that the rest of the playhouse is so lovely the plain solid sheet boarding does stand out, but adding a little rug or small piece of carpet would fix this. The playhouse will be sent to you unpainted, but it does need to be treated so the wood is protected from rot. One really awesome thing that Waltons are doing at the moment is giving people a free tub of golden brown wood treatment. Coating the 4’ x 4’ Honeypot Snug Tower & Slide Playhouse with wood treatment should be done on a yearly basis, you do this and that wood will stay rot free. When you treat the playhouse, you are also making sure that the ten year anti rot guarantee that comes with this playhouse is valid. We have seen a few playhouses from Waltons and we love the way they make sure the door has an inch or two of space around it so the kids will not trap their fingers in the door. Despite being a single door it is still a good size of, 2 feet 10 inches high and 2 feet wide so even their largest stuffed animals will be able to come in for a tea party. The front of the door looks fantastic, it has two heavy duty hinges that are black and there is also a very pretty flower design which has a small window on it as well. Including the small round window on the door there are four windows on the playhouse. With one on each side and then one on the front. These windows are made with shatterproof styrene so you have no worries about broken glass being in the playhouse when one of the kids tea parties gets a bit out of hand. The design of this playhouse is very solid and as a result it really is one very secure structure. There is no lock on the door, but it will close very firmly when the kids are not playing in it. If you do want to give the kids a little bit of privacy or perhaps you just want to make it feel more like a little house for them. Well adding some curtains or just a cheap piece of fabric to the windows will give them some privacy. If you love the look of the shed in the pictures then you can achieve this same style by using, Cuprinol Timber Shades. Or if you just want to brighten it up a little bit try using a more jazzy coloured wood treatment. 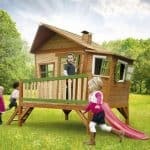 We already think that is one very well priced playhouse, but incredibly, Waltons are not trying to get more money out of you with a whole load of extras. As a matter of fact the only extra that they offer with this playhouse is their installation service. This costs an extra £154.99 and will see them build it for you when it is delivered. To be honest this is a pretty straightforward job and while it may take a few hours, we feel you could save that money and build it yourself. 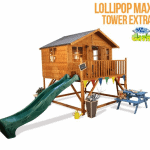 We are very pleased with the high quality of this tower playhouse and are sure your kids will have many years of fun with it. We were actually surprised with how high quality and long lasting the materials used were considering the price. Just be sure to give it a fresh coat of treatment when it needs it and this will stand strong for a lot of years. The actual playhouse is not the largest, but there is the decking, the slide and the ladder so there is a lot to this. You will need another person to help you, but this is not the hardest DIY job in the world and even a person who is not too keen on DIY should have this installed in 4-6 hours. 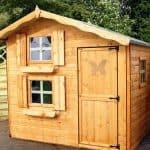 We are very impressed with how good value for money this playhouse is. It costs £299.95 and there are no extras you need to worry think about which is always a good thing. 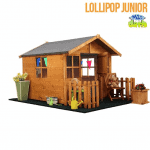 Final Thoughts: The 4’ x 4’ Honeypot Snug Tower & Slide Playhouse is ideal for those of you who want somewhere fun for the kids to play outside, but do not have a huge garden or who do not want to spend several hundred pounds. The kids will have a lot of fun playing in the playhouse and with the slide, ladder and just around this in general. There is no doubt in our minds that this is going to be a huge hit and the children will want to spend hours and hours playing with this. The price is very fair considering the years of enjoyment it is going to provide not to mention the very impressive materials used in its construction. If a fair priced playhouse is what you are after then this one is hard to beat.